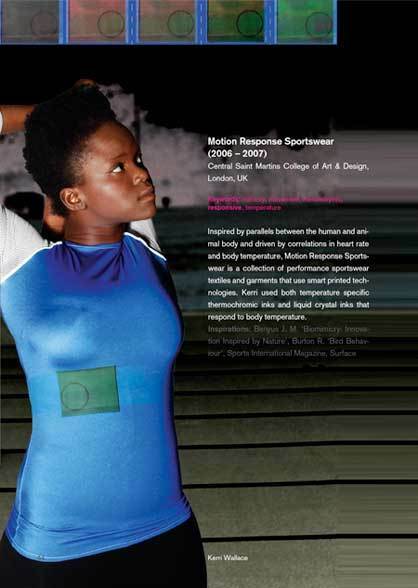 Sabine Seymour, who among other things lectures at the Parsons New School for Design, New York, has put together a collection of products and materials which looks at the close interlinking of fashion, design, technology and science. 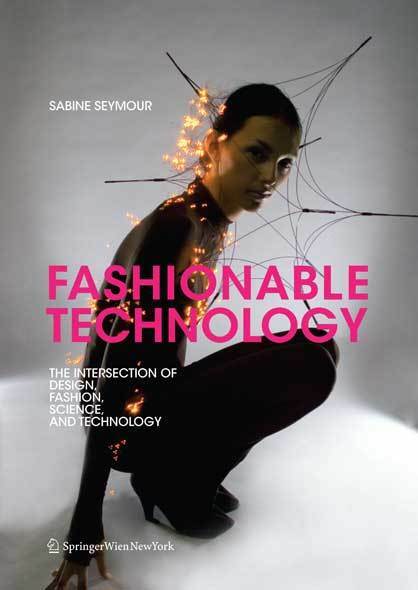 Sabine Seymour, who among other things lectures at the Parsons New School for Design, New York, has put together a collection of products and materials which looks at the close interlinking of fashion, design, technology and science. She herself appropriately describes this as an 'amalgamation'. This process of amalgamation becomes really exciting when the phase of the so-called handhelds is overcome and the aerials, micro-processors, batteries, solar cells, sensors etc. are integrated within the textiles or are even implanted fully in them. An essential item is of course Hussein Chalayan's dress with its red lasers and Swarowski crystals from the 2008 spring/summer collection, which received a great deal of attention in both fashion magazines and design blogs. Equally dramatic at least is his 'Airborne' mini skirt with its 15,600 LEDs, which plays abstract colour patterns as in a film. 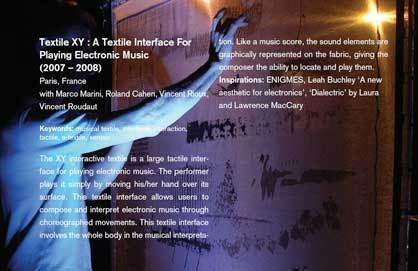 Under the heading 'ubiquitous computing' in the category 'Interactive Interfaces' we find highly decorative 'Sound Sleeves' made of a silvery metallic material. The sleeves respond to the body position of the wearer and give off shrill warning noises in the event of danger. In contrast the 'Pom Pom & Essential Wall Dimmers' light switch is an electronic fabric which resembles an amusing oven mitt with a pom-pom and has clearly been inspired by Meret Oppenheim's famous fur-covered cup. The potential of many of these prototypes, which are published for the first time here, becomes especially clear in the case of Manel Torres’ 'Spray-on Fabric' in the category 'Scientific Couture'. A textile-type material, which consists of a mixture of polymers and similar synthetic fibres, is sprayed on the human body and sets there to form a kind of instant fleece. Scents and colour pigments can even be added experimentally to the spray mixture – no wonder that this 'clothing' has been cast as a nurse's uniform for a science fiction film which is set in the year 2090. Further categories are entitled 'Sensual Being & Tangible Touch', 'Wearable Explorations' 'Sonic Landscape' and 'Material Witness' – excellent photos and short but precise texts present a wide range of unusual works and research experiments. The theoretical introduction by Sabine Seymour is supplemented by an appendix which provides a comprehensive reference list of the websites of the designers, artists, research institutes and production companies involved, as well as the materials, methods and tools. Highly recommended!! !